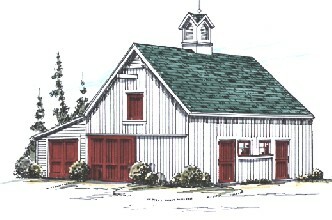 The Chestnut Horse Barn & Garage is an all-in-one shelter for your horses and a car, truck or tractor. The 12'x24' garage is wide enough for yard tools on the side walls and has room at back for a workbench. Enclosed floor area is 768 sq. ft. The loft is 460 sq. ft. Ridge height is 20'-4"